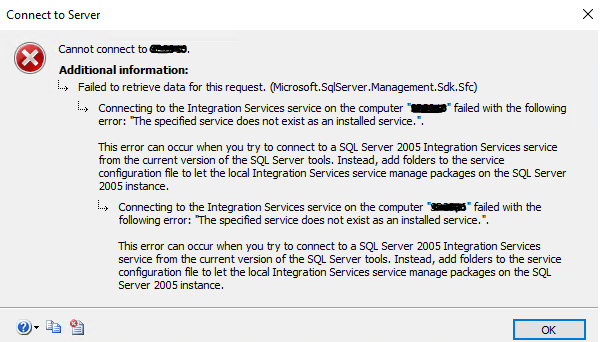 When trying to connect from SSMS v17.x to a SQL Server Integration Services 2016 instance or previous version, you get the error “Connecting to the Integration Services service on the computer failed with the following error: 'The specified service does not exist as an installed service'”. 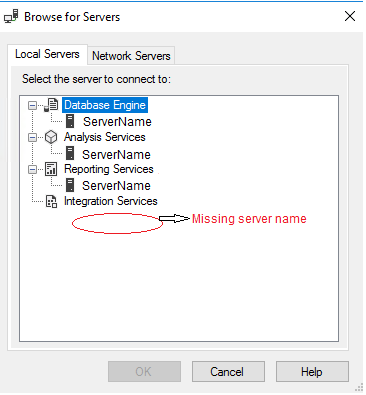 When trying to connect from SSMS v17.x to a SQL Server Integration Services 2016 instance or previous version, you get the error Connecting to the Integration Services service on the computer failed with the following error: "The specified service does not exist as an installed service". The solution is actually very simple but it is not so obvious. After many attempts to understand and solve this issue, a downgrade of the SSMS version eventually solved it. To connect to a SSIS 2016 instance you will need at least SSMS v16.5.3. For some reason, SSMS v17.x (at the moment I am writing this article the last version is 17.2) has a limitation that does not let it be able to connect to any SSIS version prior to 2017. So if you need to use SSMS to work with SSIS the best you can do by now is to download and install SSMS v16.5.3. Note: As stated above, this issue happens with SSMS v17.2 and previous minor releases of SSMS v17. It has been already reported to Microsoft so it is expected that in a future release this will be corrected. Meanwhile use an older version of SSMS when working with SSIS instances. You can track the SSMS releases bug fixes here to see when this specific bug will be fixed by Microsoft.